Holiday Cottage in Somerset. 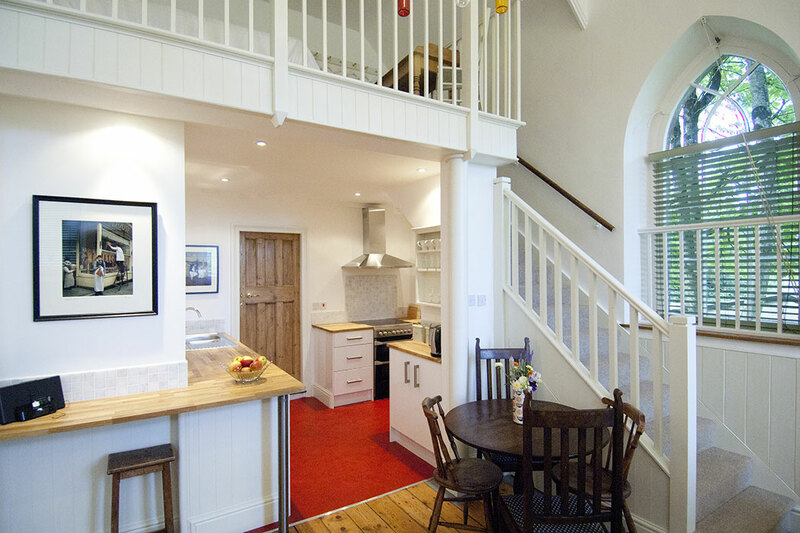 Self Catering Cottage to Rent, Somerset. 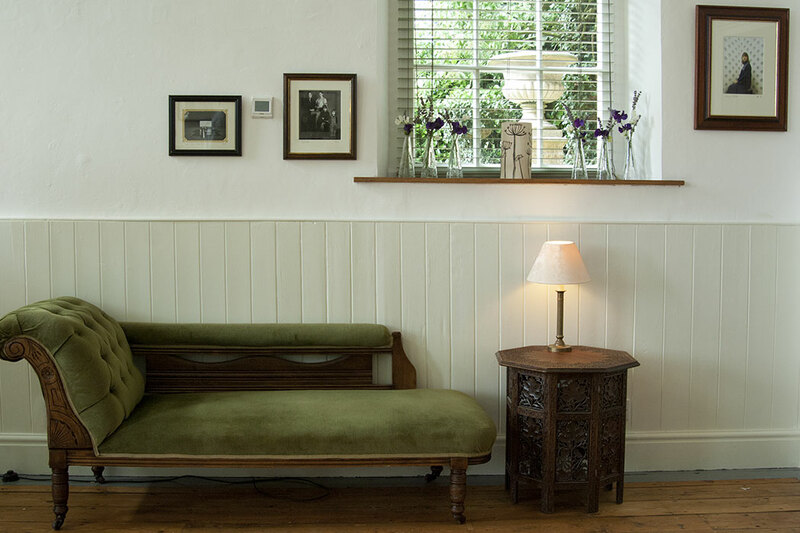 A stylishly chic, romantic, small but beautifully formed old chapel dating back to 1863, tucked away in the small hamlet of Downhead a few miles from Frome in Somerset. Chapel Studio, Downhead is in the middle of beautiful countryside on the edge of the Mendip Hills. This cute romantic West Country love nest close to wonderful walks and attractions is simply perfect for honeymoons, walkers, writers, musicians and romantic breaks. You’ll be in your own world as you enter this tranquil retreat. 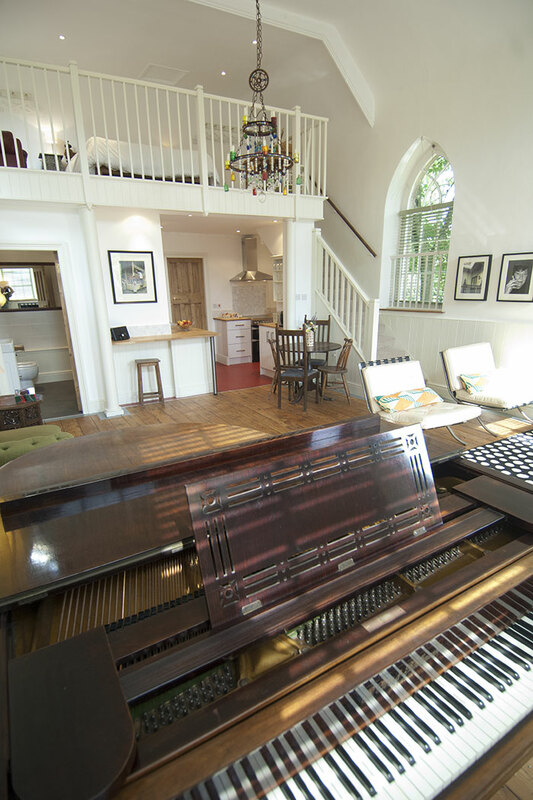 On the ground floor there is an open plan kitchen with a vaulted sitting room with a grand piano, comfy sofa and chairs with a small TV and DVD player. 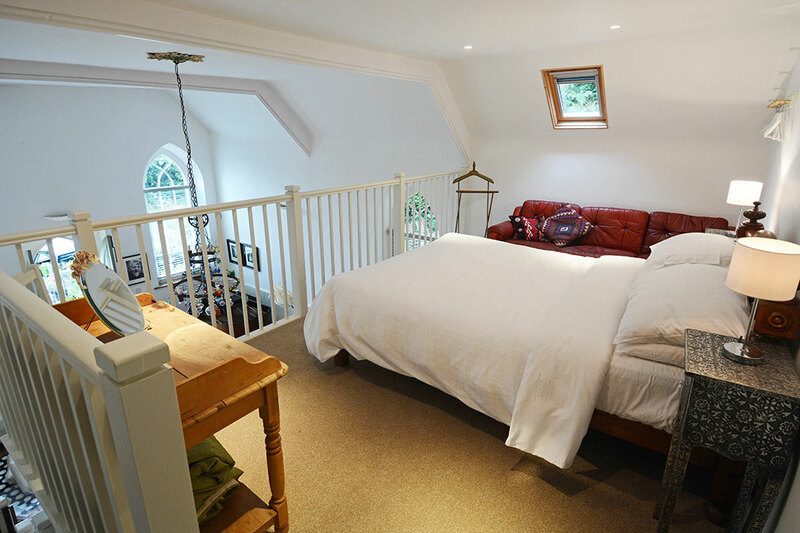 Up a small flight of stairs on to the Mezzanine is a luxurious king-size bed with 400-thread count cotton linen. 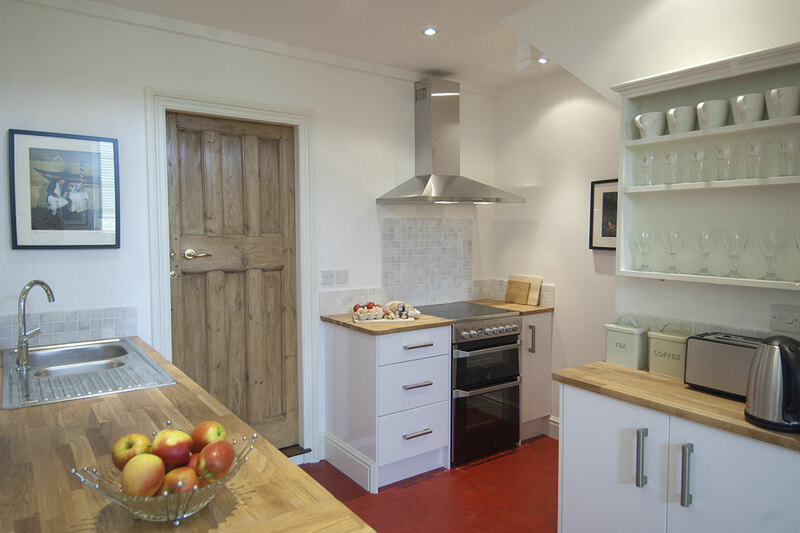 The hand built kitchen is fully equipped with dishwasher, oven, hob, microwave, coffee maker, kettle and toaster right down to ice bucket and champagne flutes, and all the pots, pans, crockery and glassware you might need. There is a small laundry room with washing machine and tumble dryer. After a day out or spent relaxing you would be able to create a romantic supper perhaps using the finest local fare which we can provide for your stay at extra cost. If you’d rather spend your break indulging in the little luxuries, let our chef prepare and deliver a mouth-watering meal for you (by prior request and subject to additional cost). 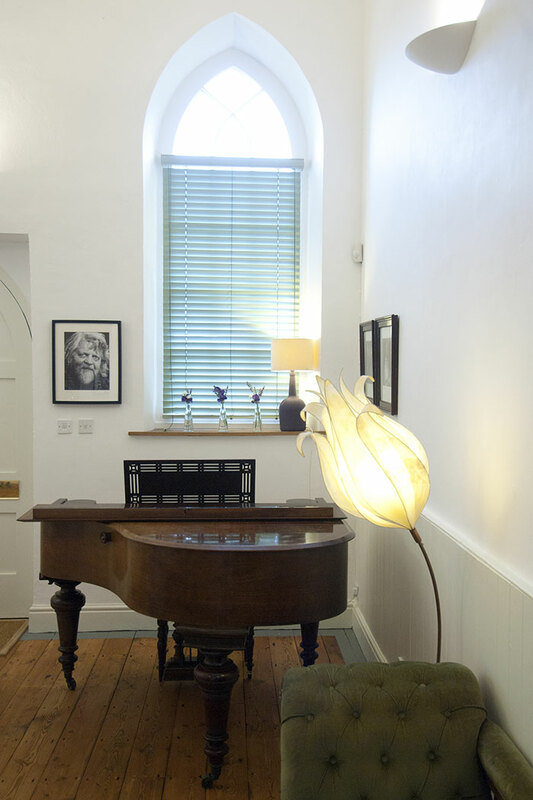 The chapel in recent years was used as a design studio by the owners, photographer Tim Mercer and his partner Helen. Tim’s photographs are part of the artwork on the walls in the chapel. 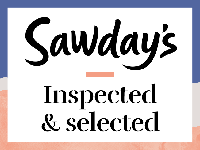 The Mendip area has an excellent choice of fine restaurants to choose from; The Talbot inn in Mells, The Chapel in Bruton, Bannatyne’s in Shepton Mallet. Gorgeous country pub with great food at The Holcombe Inn. In Frome there are delicious lunches and coffees at La Strada, The River Café and the vegetarian Garden Café. Bath is 15 miles away with a wide choice of eateries and there is the Hauser and Wirth art gallery in Bruton with the Piet Oudolf garden with the Roth Bar and Grill which has a wide variety of delicious food. 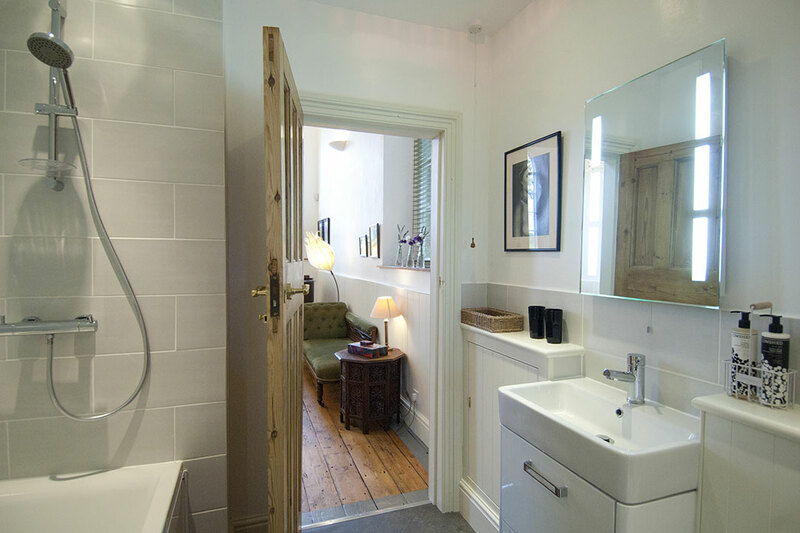 Chapel Studio is within 6 miles of Frome station. Downhead has no public transport. Click through the calendar to chooses your dates and contact Helen. Minimum 3 nights stay. Check in from 4pm and check out 11am. Please note we are flexible on booking dates but prefer weekday changeovers please. 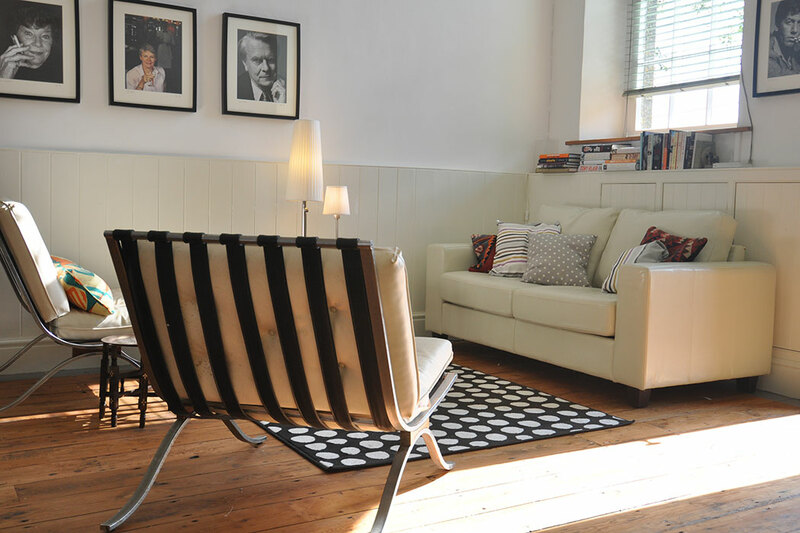 You are very welcome to stay for only one or two nights, however there is a minimum charge of £330. Pets by arrangement. £20 each pet, please let me know if you would like your pet to come. * The deposit is non-refundable if booking is cancelled within 6 weeks of your holiday. However if booking is cancelled by you prior to 6 weeks before your booked dates we will do our best to rebook and refund deposit less 15% admin charge. It is advisable to take out travel insurance as from the date of request of the full fees due they will be payable. (4 weeks prior to booking date). Amazing! We felt so happy and at home here. Unforgettable stay. Enjoyed beautiful surroundings, nature, Mells & Frome. Loved the Talbot Inn! Yummy brownies! Thank you! Just what we needed – peach and beautiful surroundings. What a wonderful escape from London. We loved it! Thank you. Lovely anniversary stay in a very unique building. A warm welcome where ever we went. Ate at The Bell Inn, Leigh-on-Mendip (10 min drive) great for your dinner & the Talbot, Mells (15 min drive) great food & beer. Thanks Helen and Tim for the welcome & provisions and also for allowing us to share your wonderful chapel. Helen made us feel incredibly welcome, and so happy to be arriving for our stay in chapel studio. It was even more beautiful than in the pictures (if this is possible!) and we were greeted with a basket of lovely food, toiletries, etc. The kitchen was wonderful for cooking, the bed was so comfortable, and the garden was beautiful to sit in and read, or have dinner at the large table. We love this place!!! We felt at home from the moment we stepped through the door, comfortable & classy. A great place to spend New year, particularly wonderful to be surrounded by Tim's jaw dropping work. We will be framing the postcards for our home. Lovely days out to Glastonbury, Frome & Bath. Denver very happy with the heated floor. Don't want to leave, will be back if you'll have us! A wonderful place to stay, so peaceful. Recommend Frome Market on a Sunday, Stourhead is also worth a visit. Thank you for making us feel so welcome. chapel studio is absolutely superb. It is a wonderful getaway for two, very spacious and well designed. 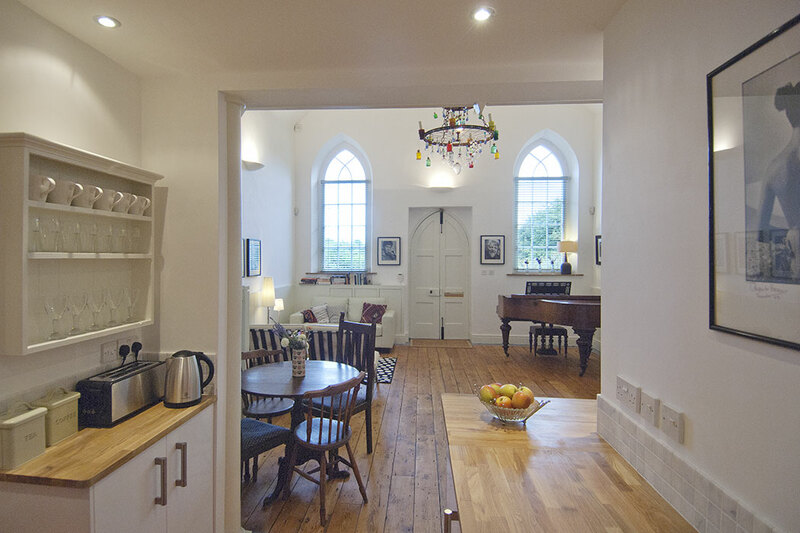 The conversion has been done extremely well making chapel studio a very comfortable and cosy place to stay. Just returned from a 3 night stay for our 10th wedding anniversary. The chapel is just beautiful, very well equipped and the perfect place to get away from it all and unwind. Great base for exploring the local area, 10 minutes to Frome and Shepton Mallet and 30 minutes to Bath. All in all we had a perfect weekend and would love to return. Lovely chapel brilliantly refurbished and extremely confortable. Had a very pleasant 3 night stay. Facilities were excellent, condition immaculate and furnishings extremely tasteful. Made for a very cosy atmosphere. Bed extremely comfortable. No noise whatsoever, day or night. Highly recommended. Would definitely stay here again in the future. We have just returned from a long weekend at the Chapel Studio. It is a lovely secluded setting but within easy reach of plenty of places to visit. The Chapel itself is beautifully decorated and very comfortable. We definitely recommend it. We just had a wonderful relaxing long weekend at the chapel, so peaceful would highly recommend. The accommodation had everything we needed and the addition of the welcome basket of food was an excellent touch. Great location, out of the way but not too far from the busier towns if needed. The best accommodation we have stayed in. chapel studio exceeded my expectations in every way. The location, the facilities, the decor, everything. The host, Helen was responsive and very helpful. Thank you so much for everything.